The full extent of the impact is a bit hazy for the moment, though it is rumoured to be much more than is officially known. 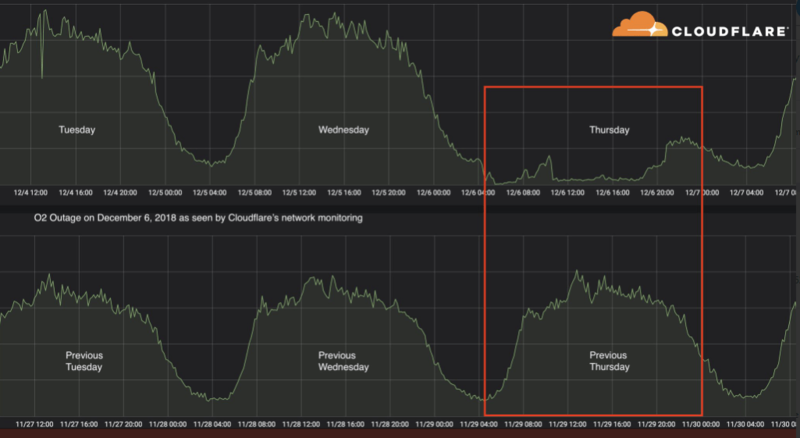 What we do know is the O2 network was down for almost all of Thursday, Softbank’s customers were plunged back to the paper days and there are ‘several’ other customers who were impacted by the issue. Ericsson has confirmed there were others, though it is remaining tight-lipped on who these operators actually are. 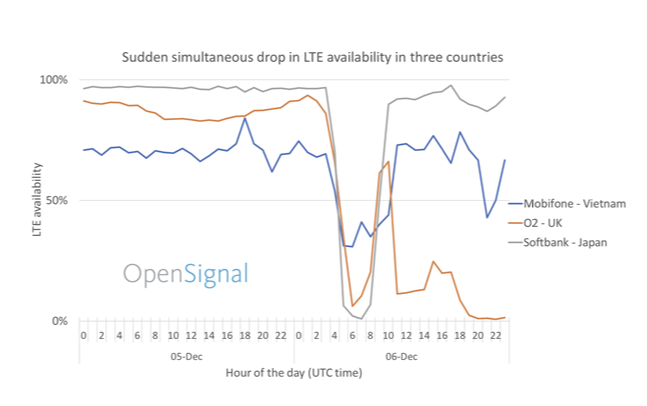 That said, as you can see from the crowdsourced data below from wireless coverage mapping company Opensignal, it would probably be a fair assumption to add Vietnam’s Mobifone to the list. Looking at the bill, The Telegraph has reported Ericsson will be facing a global bill of £100 million to compensate customers for the oversight. Ericsson is yet to respond to a request for comment, though having admitted being the root cause of the data dessert there will certainly be conversations concerning compensation. IWe understand O2 CEO Mark Evans is currently in discussion with the Ericsson management team regarding the whole issue, and the topic of damages will be included on the agenda. Ericsson UK and Ireland CEO Marielle Lindgren is certainly involved in these meetings, though we have not been able to confirm whether these specific discussions have been escalated all the way up to Group CEO Börje Ekholm. In fairness to O2, it has not palmed off responsibility completely. Last week, it confirmed it would be reimbursing customers as a result of the outage. Pay Monthly, SMB business and mobile broadband customers will be credited with two additional days of monthly airtime subscription charges by the end of January. Pay-As-You-Go customers will be given a 10% credit on a top-up in the New Year, while PAYG Go mobile broadband customers will receive a 10% discount on a Bolt On purchase. While some might suggest O2 is not completely blameless and should have had processes and systems in place to compensate for such instances, as the root cause of the disruption does lie elsewhere it does have some bargaining power in the talks. The rumoured £100 million bill would not all be credited towards O2, though as it seemed to be impacted the worst, it may well be seeking a large cheque to compensate for lost revenues associated with reimbursing customers. Ericsson has narrowed the root cause of the issue down to two specific software versions of the SGSN–MME (Serving GPRS Support Node – Mobility Management Entity). These nodes in the core of O2’s network caused the calamity, as the license for the software expired. For Ericsson, there might well be no choice. Some are suggesting up to 20 operators were impacted by the expired software license and considering the importance of relationships ahead of the up-coming 5G bonanza, the vendor will need to do everything in its power to ensure favourable terms. It seems buying its way out of this mess might be the only sensible route to take. With O2 UK and Softbank customers being thrown back to the 90s after a network outage, reports have emerged suggest Ericsson was the root cause. “We’re aware that our customers are unable to use data this morning,” O2 has said in a statement. “One of our third-party suppliers has identified a global software issue in their system which has impacted us. Although there is no official confirmation of which supplier this might be, the FT has sources which point the finger towards Ericsson. According to two people directly involved, an issue relating to software in the systems provided by Ericsson has been identified. It’s unlikely the guilty party will take ownership for the fault until the PR madness has died down, especially considering telcos will be more stringently examining the track records of suppliers ahead of the 5G bonanza, and in light of recent issues at Huawei and ZTE. Just so you are aware, O2’s primary suppliers for network infrastructure are Ericsson and Nokia. For O2, the ‘double-edged sword’ metaphor is hitting home hard right now. Other telcos have experienced outages in the last couple of months, EE and Vodafone certainly did in October, though it wasn’t as widely reported or condemned on social media. In leading the market share rankings in the UK, an O2 outage would certainly impact more customers than other similar examples.